Starting in October, when you check in for your United flight online or at a kiosk, you might be asked how much you’d be willing to take to give up your seat. 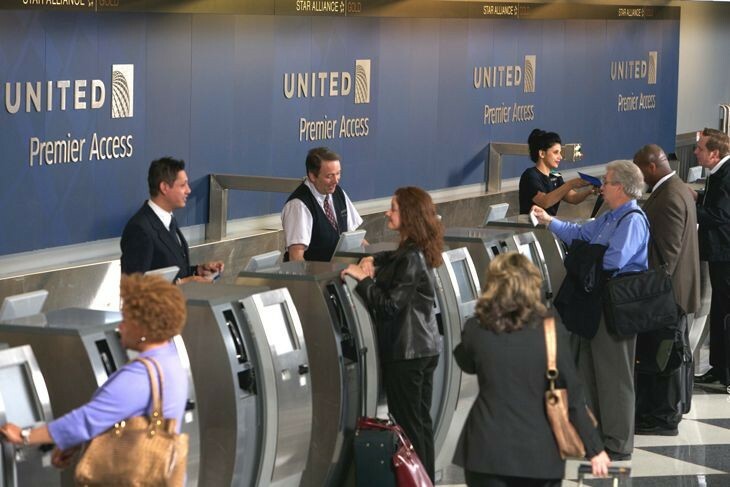 Following Delta’s lead (again), United is set to implement a new bidding process for bumps. 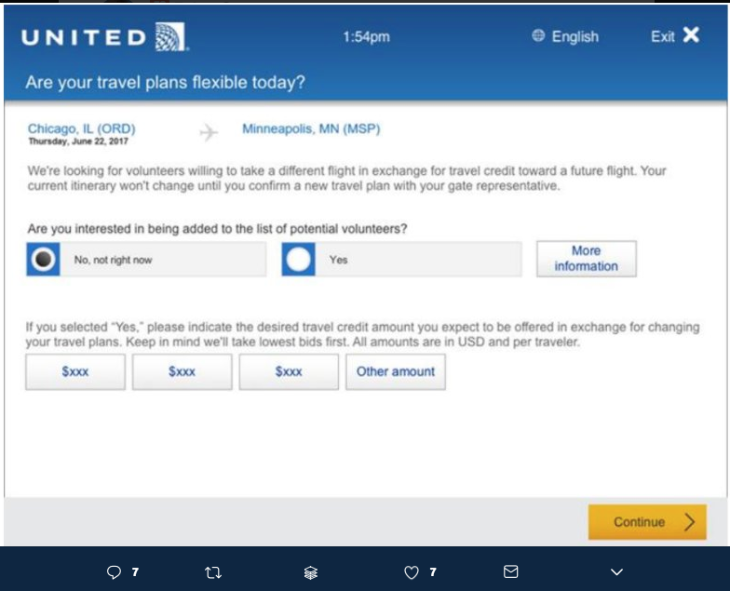 So when you check in for an overbooked flight, you’ll be asked if you are interested in being put on a list of potential volunteers– and if so, for how much. You’ll then be offered three different dollar amounts (in travel credits, not cash) to volunteer your seat. If United is forced to involuntarily bump passengers, it will choose from the list of lowest bidders. But don’t get your hopes up for much of a jackpot. After the David Dao dragging incident, involuntary bumpings are down at United (and all carriers). This probably sounds like deja vu to Delta fliers who know that the airline rolled out a similar plan six years ago. 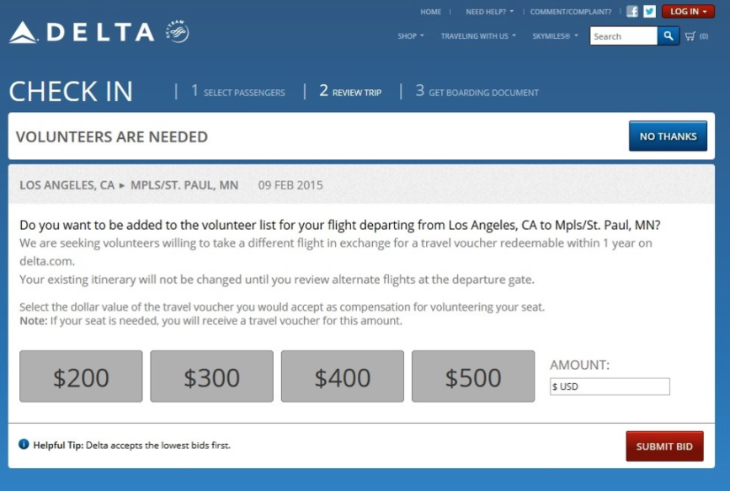 Have you tried Delta’s new bidding for bumps process at check in? Instead of the old process where Delta would ask for volunteers and start the bidding over the PA system at the gate, the carrier now asks passengers as they check in (online or at kiosks) if they’d be willing to give up their seat and take a later flight. Once you say yes, you are then asked for the minimum amount you’d be willing to accept in exchange for your seat. Your offer is then sent to gate agents and added to a list of other volunteers, with the lowest bids at the top. If your bid is accepted, gate agents will call you to the podium to discuss the flight options they can offer (standby or confirmed), as well as extras like meal vouchers or upgrades. At that point, you can accept or refuse their offer. 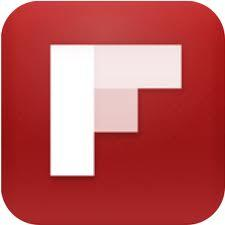 If you refuse, they just move on to the next lowest bidder (if there is one). Last April, PBS News Hour did a special report on How Delta Masters the Game of Overbooking Flights, which could have been the impetus for United to get on board with a similar plan. What’s the most money (or credit) you’ve ever scored from a voluntary or involuntary bumping? Please leave it in the comments.